While SurveyMonkey offers a free edition, this edition does not allow for integration with other applications and is also limited to the number of questions and responses per survey. The minimum edition that we recommend is the Standard Edition. You need Portal Admin access to connect SurveyMonkey to Wisenet. Required Knowledge: Only one SurveyMonkey account can be connected to a Wisenet account at any one time. Required Pre-Steps: Understand the SurveyMonkey Plans and Pricing structure and Sign Up to your preferred plan. 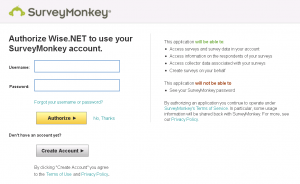 If you have just purchased a SurveyMonkey Plan and need to create a new account, follow the steps below for it to integrate in Wisenet.